As we approach the centenary of the end of the First World War, a group of local residents, led by Steve Tagg, a member of Burghwallis Royal British Legion, visited World War 1 battlefield sites. 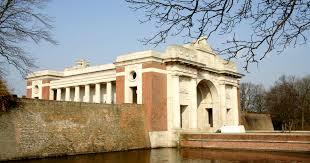 The visit included Tyne Cot cemetery, the Menin Gate, Thiepval, Vimy Ridge, and other sites in France and Belgium. 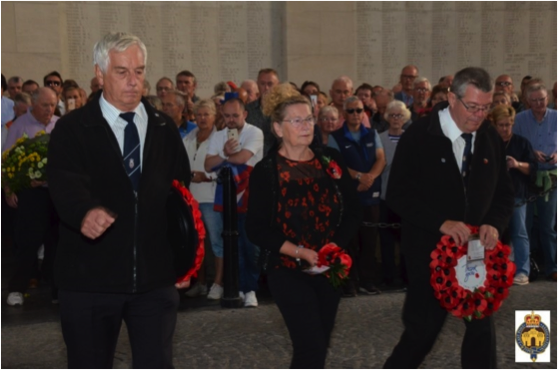 The group took part in the Last Post ceremony at the Menin Gate on September 9th, and laid a wreath on behalf of the men of Burghwallis who never came home. The Menin Gate is just one of several memorials for soldiers who were killed in the conflict, and who have no known graves. Whilst in the area, Dave and Rob decided to see if they could locate the cemeteries of any from Burghwallis whose names are on our Memorial. 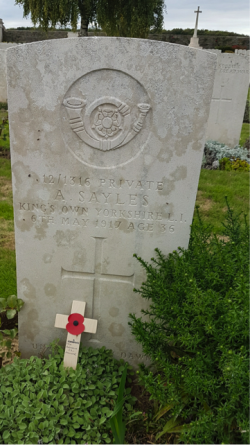 In searching for the name Arthur Sales, as recorded on the Burghwallis War Memorial, and spelt the same way on the memorial in St. Helen’s Church, one interesting find on the Commonwealth War Graves website was an A. Sayles of 12Bt. KOYLI. Research then showed that he was the son of Thomas and Mary Sayles, of Adwick-le-Street, husband of Florence May, of Burghwallis. Rob is reasonably sure therefore that they found the right connection. 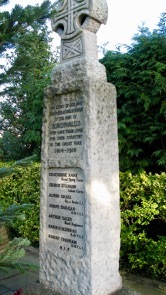 Pictured below is the grave of said Arthur Sayles. The local branch of the British Legion are very active in keeping alive the memory of our fallen, with events and fund-raising activities every year. This year, being the centenary, additional acts of remembrance are being planned, locally and nationally. In addition to the usual parade on Remembrance Sunday, there will be a display produced by Campsmount School at our Memorial. Also, in co-ordination with other BL branches and communities across the whole of the UK, there will be a further event in the car park of The Burghwallis pub, starting at 6.55 pm, to read out the names of the local fallen, the sounding of the Last Post, and the lighting of a beacon. 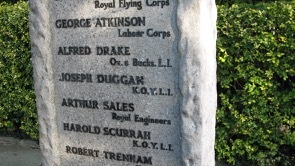 There are more interesting details about Arthur Sayles on your website under ‘Village History’ & ‘War Memorial’. Perhaps you could add a link? We slipped up here and forgot to add the extra details that you spotted. The article has now been updated, many thanks for letting us know.